Located in Sant Marti, The Gates Diagonal Barcelona is within a mile (2 km) of popular sights such as Sagrada Familia and Arc de Triomf. This 4-star hotel welcomes guests with 240 rooms and conveniences like an outdoor pool, free in-room WiFi, and a fitness centre. It's connected to the convention centre in central Barcelona and also close to Barcelona Zoo and Palau de la Musica Catalana. Enjoy a bite to eat at Piano Restaurant, the hotel's onsite restaurant. Savor a meal from the privacy of your room with room service, or get a pick-me-up at the coffee shop/café. For your convenience, a buffet breakfast is served for a fee on weekdays from 7:00 AM to 10:30 AM and at weekends from 7:00 AM to 11:00 AM. A flat-screen TV comes with satellite channels, and guests can stay connected with free WiFi and wired Internet. The bathroom offers hairdryers and designer toiletries. Other standard amenities include a minibar, a safe and an ironing board. 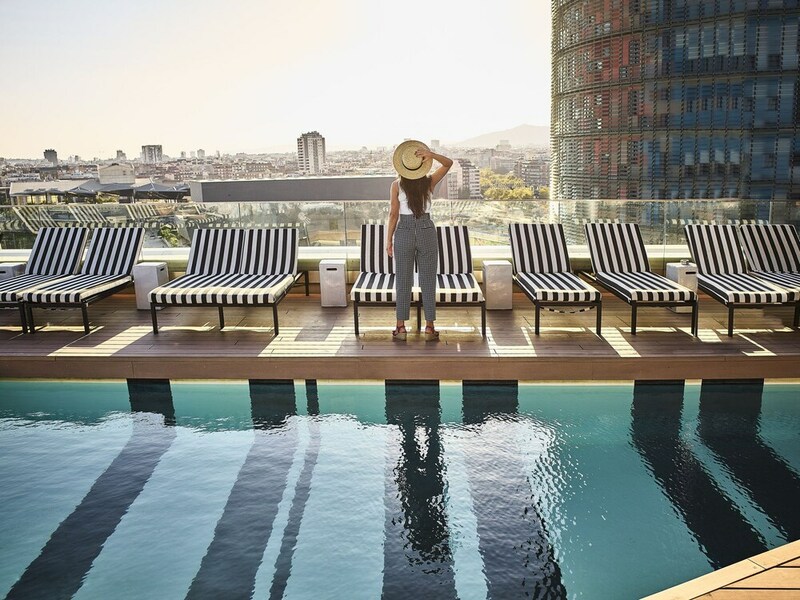 At The Gates Diagonal Barcelona, guests enjoy an outdoor pool, a fitness centre, and a rooftop terrace. Self parking is offered for EUR 18 per day. Multilingual staff at the 24-hour front desk can assist with luggage storage, tours or tickets, and dry cleaning/laundry. Additional amenities include free WiFi in public areas, a business centre, and a seasonal outdoor pool. The Gates Diagonal Barcelona features an outdoor pool and a fitness centre. The hotel offers a restaurant and a coffee shop/café. Guests can unwind with a drink at one of the hotel's bars, which include 2 bars/lounges and A poolside bar. Wireless Internet access is complimentary. This 4-star property offers access to a business centre. Event facilities measure 4596 square feet (427 square metres). This business-friendly hotel also offers a rooftop terrace, tour or ticket assistance and multilingual staff. On-site parking is available (surcharge). The Gates Diagonal Barcelona is a smoke-free property. Cash transactions at this property cannot exceed EUR 2500 due to national regulations. For further details, please contact the property using the information in the booking confirmation. This property's policy is to refuse certain bookings for the purpose of group events or parties, including pre-wedding stag/bachelor and hen/bachelorette parties. The seasonal pool will be open from May to October.Only registered guests are allowed in the guest rooms. Some facilities may have restricted access. Guests can contact the property for details using the contact information on the booking confirmation.